Home Archive by Category "Boat Shows"
Some things you just never get tired of. As this is where it all started when we finally launched FAB Dock to the boating public, Sanctuary Cove doubles as our birthday celebration every year. So we have even more fun than usual. Having two more girls on the stand along with the usual male suspects meant that there were some pretty faces for interested boaties to talk to instead of just us boring business owners. Thanks Rosie, Laurie and Sharon for providing more entertainment and laughs than any other boat show that we have ever exhibited at. The only thing that matched the girls for beauty was Sharon’s boat that was proudly displayed in its FAB Dock. The weather was perfect, the crowds were up and their was optimism in the air and we have been busy ever since measuring up boats for new FAB Docks and getting them built and installed. And so a big thank you to all our existing clients who have made FAB Dock such a success and helped us improve and perfect our product to be the number one selling dry docking system in the world. But we aren’t resting on our laurels with some major advancements in the pipeline due for release very soon. What a weekend everyone had at this year’s Mandurah Boat Show. For once, we had perfect weather in which to set up our now famous FAB Dock tent and reinstall Mark’s FAB Dock underneath his tricked up 240 Boston Whaler Outrage. But this sense of dryness and warmth disappeared as quickly as it arrived and we spent most of Friday huddled in our tent avoiding the gale force winds and frequent showers, along with anyone who was brave enough to risk the elements to view the latest and greatest in marine products. It’s amazing how interested some people can be in a dry docking system, even though they don’t even own a boat, when it is pouring rain and we had a dry tent. But the weekend more than made up for this wet and windy start and the crowds flocked in. Justin, Hayley and I were swamped with enthusiastic boaties keen to learn how a FAB Dock could save their boats. 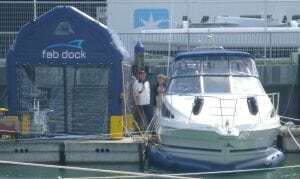 The main difference, though, between these requests and every other boat show that we have exhibited at, is that most of these people had seen a FAB Dock either in the water, in a magazine, on our website, or a friend had told them about it. We are all so very proud that all these years of product development, excellent customer service and just plain hard work is finally paying off. So much so that I had to extend my stay out West by another week so that we could install some of the FAB Docks that had been ordered previously as well as measure up all the new ones that were ordered at the show. So from the bottom of my heart, and the whole team here at FAB Dock, we would like to thank all our customers who have made us the number one dry docking system in the world. Having our FAB Docks manufactured in New Zealand for the past three years, we thought it only fair that we actually share the benefits of our world class dry docking system with our ANZAC neighbours. 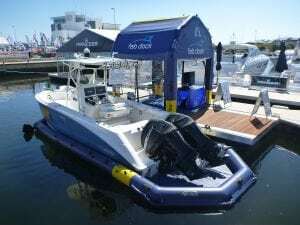 The rain abated to periodic showers throughout the weekend for the Auckland Boat Show, but if you have been following my stories, rain at a boat show is a fact of life for us. But they breed these Kiwis tough over here and a bit of rain and 50 knot winds isn’t going to stop them from checking out the latest boats and marine products on show. And so, on top of the normal enthusiastic response we receive from guests at boat shows all over the world, Kiwis were even more amazed that such a worldwide product is actually manufactured in their country. 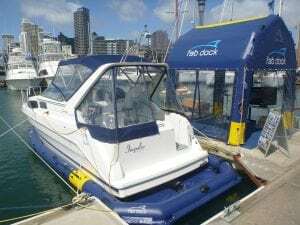 They now have an environmentally friendly alternative to keeping their boat clean, that also helps them berth their boat, is nearly half the price of any other option, and is made in NZ! With FAB Docks already in the water at Orakei Harbour and Half Moon Bay, for those that couldn’t make it down to the show, you can still arrange to get a close up look by calling Bill Richmond on 0274 732 386 and he will be more than happy to show you one and explain all the benefits of having a FAB Dock under your boat. I am looking forward to my next visit to help Bill install his first batch of FAB Docks and see if Auckland does actually warm up in the summertime. The whole team here at FAB Dock wish to offer a very warm welcome to Mohamed Ahmadi and Yousef Mohseni who have recently joined our expanding family as agents for the Middle East region. 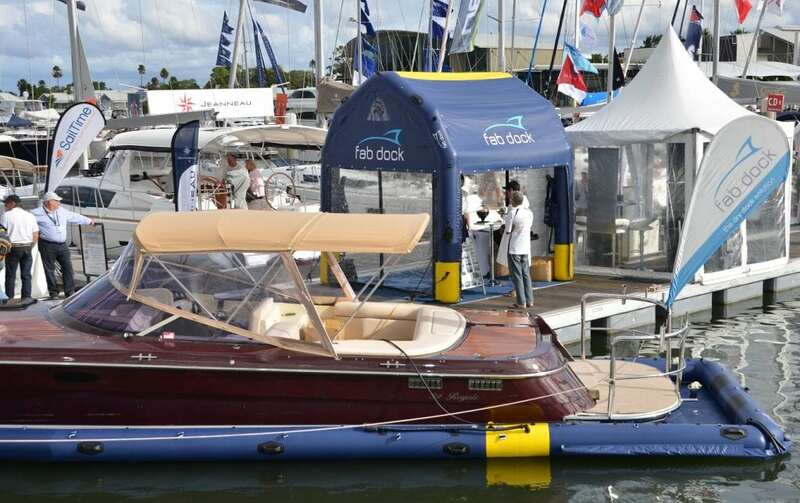 Having already gained a number of world renowned brands under their marine business umbrella, they were excited to add FAB Dock to complement these lines. The first step was to install a FAB Dock under their Ski Nautique G25 which is one of the other brands that they represent and that they also use for their wakeboarding school; the first of its kind in Bahrain. And Yousef didn’t shirk his responsibilities on his first assignment, helping me for a few hours with the installation in the middle of a 45 degree celsius day. And for those that have never experienced the delights and culture of Bahrain, take my advice, and make it a priority. It is truly a crossroads of the world’s cultures, with some of the most hospitable and welcoming people that I have ever met, with Mohamed and Yousef at the top of the list. I would love to describe in detail just how amazing Mohamed’s family is and just how spectacular the palace that his father has built is, but that is another whole story right there, except to say that his father is one of the most amazing and fascinating men I have ever met in all my worldwide travels. I am already looking forward to my next visit to the region to help install our first batch of FAB Docks and spread the FAB Dock brand throughout the other Gulf Countries. Sharif, with Sharon and myself in the guest sitting room of his home. All the very best guys. 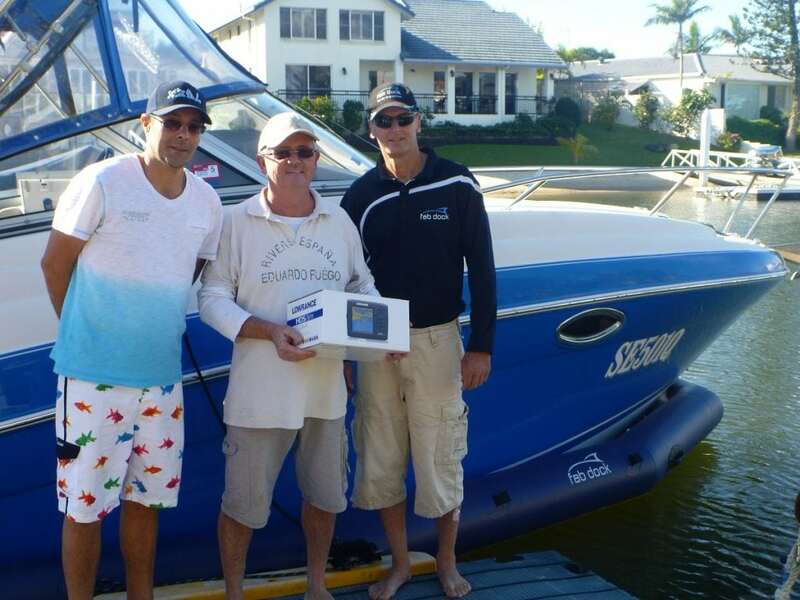 Peter and Zel became the first FAB Dock customers to receive their promotional Lowrance Chart Plotter for purchasing their FAB Dock at the recent Sanctuary Cove International Boat Show. Even though navigating the canals through the Gold Coast is easy enough, Peter and Zel are excited about being able to explore further afield with the confidence of having their new Lowrance Chart plotter mounted onto the dash of their beautiful Four Winns. Not only does the Lowrance unit fit perfectly into the dash space, but the FAB Dock also matches the unique colour of their highly polished cruiser. We would like to take this opportunity to thank Laura and the whole team at Lowrance for their support in this joint promotion and congratulate them on their world class product range. But on a more sombre note, Zel’s mum has unfortunately been struck down with cancer and Zel is helping her to battle it. He has written a song that he has launched on You Tube with all proceeds going to cancer research. So to help Zel’s mum and all cancer sufferers, you can watch Zel’s song at http://www.youtube.com/watch?v=DBhTrqRwfkw and then purchase it through iTunes to donate. We wish them all the best.